An Airbag for Cycling on Maui! Is an Invisible Bike Helmet for You? 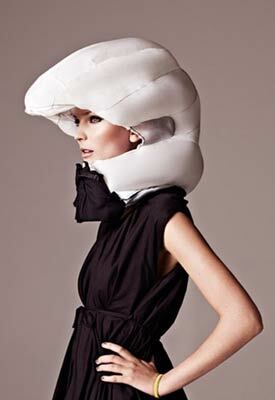 An invisible bike helmet, the Hovding deployed airbag. I was astounded when I heard about the new invisible bike helmet! Though most serious cycling enthusiasts are likely to say "Quit whining and get on with your bike ride! ", some bike riders simply grin and bear feelings of bike helmet discomfort because they know they need to protect their head while riding. When outfitting a bicycle rental on Maui or upon return of a bike rental after a long ride, we seldom hear grumbling about discomforts of bike helmets. While the helmets we include with our Maui bicycle rentals are as comfortable as possible, like the inventors of the Hovding invisible bike helmet noted, some bike helmets "are so bulky like a hard mushroom on your head". Wouldn't it be amazing to have the option to go without a bike helmet with even better protection than available with current bike helmet technology? Well, thanks to a couple of very smart Swedish women, their invisible bike helmet may provide just what some are seeking in a bike helmet. Introducing, The Hovding invisible bike helmet with airbag technology. "If people say it’s impossible we have to prove them wrong.”- Design students Anna and Terese took on a giant challenge as an exam project, something no one had done before. If they could swing it, it would for sure be revolutionary. The bicycle is a tool to change the world. If we use bikes AND travel safe: Life will be better for all. Bike Video from http://vimeo.com/focusf on http://vimeo.com. 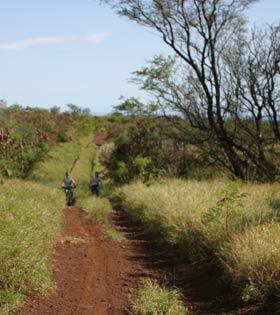 Mountain bike ride trails on Maui. Due to the device being is a little bulky for our tropical weather, I'd guess most bike riders wouldn't opt to wear the airbag collar while cycling on Maui. Still, a cool cycling invention worth noting in here in our Maui bike blog. Use the comments section below to share if you would prefer the new invisible airbag bike helmet? Not quite ready for an invisible airbag helmet and looking for a traditional bike helmet to wear on your cycling vacation on Maui? Visit the West Maui Cycles bike shop for bike helmets and bicycle gear or cycling accessories. Be sure to ask our friendly staff about recommendations for tips about Maui bike rides. From bicycle repairs and service to a huge selection of bicycle rentals, West Maui Cycles bike shop in Lahaina has all your Maui cycling needs covered! Ready to make a bicycle rental reservation for your next Maui cycling vacation?